Tim Counts served as a pastor in Washington state and New Mexico before coming to Northshire Baptist. Pastor Tim is thankful for his time at The Master’s Seminary, where he received his M.Div. He is passionate about preaching God’s Word expositorily, verse by verse, because He knows that the Holy Spirit uses the inspired Word of God to bring salvation and growth in Christ-likeness. Pastor Tim loves to see the power of the gospel at work as people come to know Christ as their Savior and Lord, and as believers grow in their understanding of how the gospel affects their daily lives. 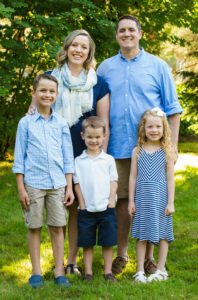 He longs to see the gospel advanced in New England and serves on the Board of Directors for the Baptist Convention of New England, is involved in the Green Mountain Baptist Association, and encourages church planter friends. He blogs regularly at “He Must Become Greater.” His writing has been featured at ministries such as Desiring God, The Gospel Coalition, 9Marks, For the Church, Challies, The Family Research Council, The Cripplegate, and newspapers throughout Vermont. Pastor Tim is also a contributor to a devotional book and a devotional magazine. Tim has been married to his best friend Melanie since 2003. They have 3 children.